Holy freaking flavor. I just put bacon and eggs in your ramen! I have officially found my new favorite comfort food. The best part about said comfort food is that this barely takes any time at all. YES. It doesn’t take as long as other fabulous comfort foods, things like mac and cheese or pot roast or whatever. This is only going to take you about 30 minutes! Maybe less. I need to go make a bowl right now because I can’t even stand to talk about it without consuming it again. IT’S SO GOOD. I was actually planning on making a leftover turkey ramen for closer to Thanksgiving. And as I was planning that, I came across food52’s bacon and egg ramen and mentally and emotionally could not make one other recipe until I got this one out of my system. Bacon and eggs? Ramen for breakfast? A handful of spinach for health? Really don’t even know what else I want. NOTHING. I want nothing else. I’m hoping Eddie is cool with bacon and egg ramen for Friday night dinner. But really, I have just been craving this every single day. It’s probably due to the lingering symptoms of a cold and the fact that the weather keeps dipping all over the place, but really it’s because it taste fantastic. Lots of flavor and lots of texture. Oh and let’s talk about the BEST part of this dish: it’s acceptable to eat at any time. Sure, it probably leans a little more towards the whole breakfast for dinner trend (which I’m the queen of, hello! ), but if you want this for breakfast? HAVE IT. LOOK AT THE CRISPY BACON THOUGH. 2 to 4 eggs, poached, soft boiled, fried, whatever you’d like! Heat a skillet over medium-low heat and fry the bacon until crispy. Remove it from the pan and place it on a paper towel to drain excess grease. Heat a saucepan over medium-low heat and add a tablespoon of the bacon grease. Add the garlic, ginger, green onions and piece of lemon grass. Stir and cook for 1 minute. Add the chicken stock. Bring the mixture to a simmer and cover. Cook for 10 to 15 minutes. Break the ramen noodle block in half. Place each half in a bowl. Top it with a handful of fresh spinach. Pour the broth over top of each block so it just covers the noodles. Let the noodles sit for 2 to 3 minutes, then start to stir and move them apart. Add a few pieces of nori sheets to each bowl. Add the eggs over top. Drizzle with soy sauce and toasted sesame oil. Cover with sesame seeds and furikake. Add the crispy bacon. Taste and seasoned additionally if needed. I like LOTS of sesame oil on mine! Add chili garlic paste or sriracha if you like heat. Quite possibly my dream meal. I have a wicked yucky cold this week. I feel like this would nurse me back to health! Craving a big bowl of this! love how there’s bacon and soft boiled eggs, but also that broth; it sounds so rich and flavorful! Omg! I love ramen in almost any form. 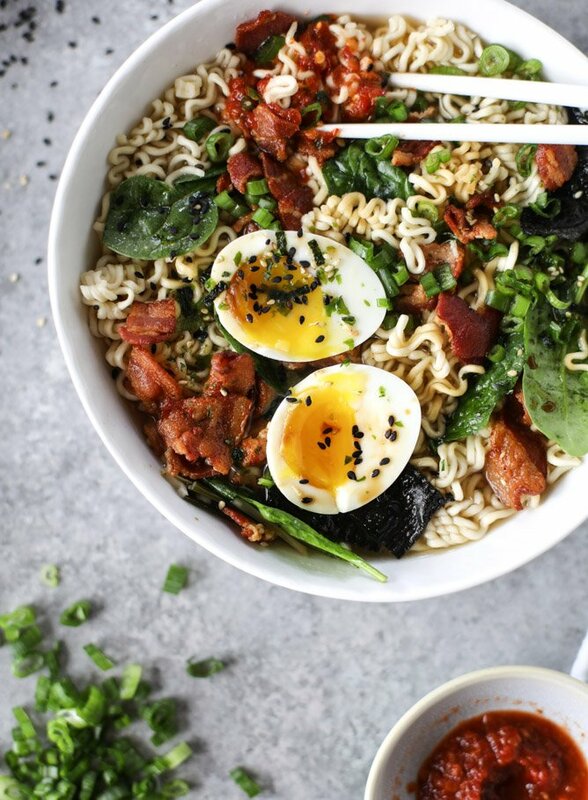 This ramen though with bacon and soft boiled eggs sound soo soo good. I see my new go to comfort food! Hilarious delicious typo spotted: you’ve listed “chili garlic pasta” as a topping, and although that sounds INCREDIBLE, I assume you mean paste! I was skimming and read furikake as fruitcake and had to do a double take because I didn’t think you would trash ramen with fruitcake. Okay so I have been eating bacon and egg fried rice almost nonstop and now going to change up my ramen because breakfast food always wins. This ramen is not only beautiful but sounds DELICIOUS!! My mom has been making variations of this for me since I was a little kid and this recipe really reminds me of her. I remember telling my friends about it and they said it was gross, but who’s laughing now? Other really good ramen combinations with soft-boiled eggs include turkey bacon and Canadian bacon… I just want an excuse to eat bacon. I know this isn’t a super huge jump, but have you tried this recipe with pepper bacon? My roommate and I made this last night. It was soooo good! and so easy. quick enough for a weeknight meal! I made this after seeing your unreal video on Instagram today! It looked too delicious NOT to try!! I absolutely loved the ginger and garlic flavours – such a hit. Love this!! Ramen is one of our favorite meals out but we didn’t think making it at home would even compare. It was so quick and easy to make with ingredients we had on hand. This will go into a regular meal rotation. Thank you! I’m a novice to lemongrass. Do you just put it in the pot as is for flavor and discard it like a bay leaf? Or can you eat it in the soup?